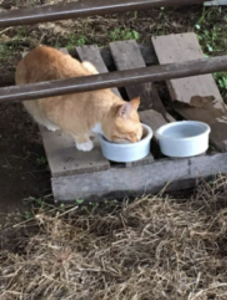 Bobby the cat has been a resident of NTCC’s Ag Complex for several months. Just recently, Bobby was given a proper home. Bobby has been living in Northeast Texas Community College’s Ag Complex for months now. But it’s okay, because Bobby is a cat. The staff at the ranch didn’t mind Bobby, but expected him to work at keeping the grounds clear of rodents. One day, while volunteering on campus with Plant Services, cat-lovers, Joe and Peg Coutermarsh, encountered the thin and hungered cat. Signs pointed to mistreatment in his past, causing him to be skittish around people. Joe and Peg contacted Sheri Carson, director of Kitty Cove Rescue, for advice on how to approach the reserved feline. Joe and Peg took her advice and returned daily to feed Bobby, or Bob for short. For the first month, they waited for him at the fence row by the woods where he would finally make an appearance and cautiously wait for his meal to be served. After being shown so much kindness, Bobby started hanging around the outbuildings and coming out in the open more often. Wormer was snuck into his food, helping him regain his shape, and when the weather grew colder, Joe and Peg made sure Bob had a warm place to sleep. Eventually, it only made sense to adopt Bobby. But first, he had to be captured and transported to the vet for vaccinations and neutering before being adopted. The plan was to transport him immediately from the vet’s office to his new owners. Two attempts were made to get Bobby into the large carrier he had become accustomed to sleeping in, but Bobby had to have things on his terms. Fortunately, the Bobby was captured the following morning. The day of Bobby’s procedure the vet informed them that he tested positive for FIV or feline immunodeficiency virus and asked if they wanted to go ahead and put him down. Carson knew it wasn’t her decision to make, so she called Peg. If they decided against the adoption, Carson was confident that she could find someone else to adopt Bobby. “They did not know anything about FIV. I gave them some websites to look at and to think it over. When they understood there was no special treatment time intensive care necessary, they felt better about it. I just told them to be careful of infections and be sure they’re treated,” said Carson. If anyone would like to get involved with Kitty Cove Rescue while attended NTCC, you can learn more about them by visiting their Facebook page or contacting Rico Willis Director of Student Activities.